Kiprah Glipang dance which is one of Probolinggo traditional dance and has been develop among the people’s life. This dance is conducted by the traditional music called “Glipang”. This dance reflected how strong and firm the men who join and become the soldier. Kiprah Glipang popularly came from Pendil – Banyuanyar village, that’s why people say that Pendil – Banyuanyar is the place of Kiprah Glipang from. In fact, Pendil village in Banyuanyar district is publishing this traditional dance to all over Probolinggo area. Ngiring kucing ceremony is one of Indonesia traditional ceremony that comes from Probolinggo regency. It is held in Wonokerso village, Sumber district, Probolinggo regency, East java. The local inhabitant in that area is Tengger Javanese ethnicity who stay around Mount Bromo. 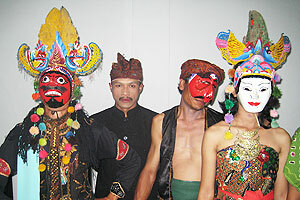 Ngiring kucing is one of the traditional dance that always be celebrate till this period. 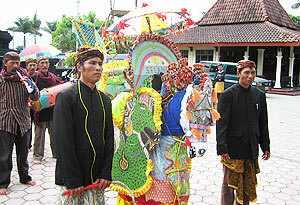 Kuda Kencak, we can say “crazy horse” that usually used for circumstance event. Ketipung (like a small drum in gamelan ensemble) this is the instrument that can be used for ‘Kuda kencak’ procession and any other ceremony. This ketipung is a Tenggeresse instrument. Sesaji, is Ritual offering. It contains agricultural produce, animals and pets. Tugel kuncung ceremony or Tugel gombak is also one of traditional ceremony that held by Tengger society in wonokerso village, Sumber district, Probolinggo regency, East Java. This ceremony held for four years old boy, who are ready to take the initiation. The boys’ forehead hair has been cut in order to get bless and welfare from God. In other word, Tugel Kuncung is hair cut ceremony for the boys, while; Tugel Gombak is the ceremony for the girls. This ceremony is obliged ceremony for Tengger people, which held once in a lifetime. The paranormal is cutting their hair. Before the ceremony, the society saying together in prays in local Pura.